Action Games Miniatures released their new 1-Player bundles for Drake over in their webshop. We at AGM are very proud to release our first 1 Player sets! Rivercrest Swordsmen and Rivercrest Scouts are also now available for purchase on the store and as part of the Builders Alliance starter bundle. Start building your Drake army with $49.99 army bundles that include a dragon, supporting troops and creatures, a deck of cards, and free dice! Not only that, but everything in the store is on sale for 25-35% off! Action Games Miniatures has some new miniatures they've added to their new webshop. They're also having themselves a sale. We've added new models to the store! The Terrax, Kaymayuk Warriors, and Kaymayuk Chief are now available to flesh out your Great Mystics force. Also, we now offer free shipping for orders over $75! We still have some discount codes left as well. Enter DRAGONS at checkout for 20% off! 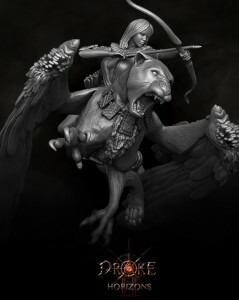 Action Games Miniatures has opened up their webstore for Drake, their fantasy miniatures game. 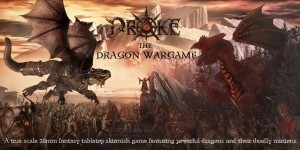 Drake is a fantasy miniature wargame where each player fields an army led by a powerful dragon. The game is played with 28 mm miniatures, with massive dragon models as centrepieces of the army. The human models are true scale, which means that their proportions are not exaggerated or cartoonish, so the dragon models look terrifyingly huge compared to their followers! The dragon leading your army also supports it by casting spells and summoning monsters! Players can change how their army plays by building a deck of cards that represent the spells their dragon can cast in the game. Drake will be available in a two-player box that contains two dragons and everything you need to start playing games with a friend. Additional models and accessories can be purchased on the store, with more to come soon! Action Games Miniatures has posted up the starter rules for Drake on their website. They're free to download, so why not grab yourself a copy? AGM is proud to present these condensed starter rules for Drake: The Dragon Wargame. This free to download document was designed to get new people into the game quickly and allow veteran players to get a fee for our game universe with ease. We hope you grab a copy! Actin Games Miniatures has opened up their PayPal option for people that couldn't get in on their Drake II Kickstarter campaign. Alright everyone its time for the amazing PayPal / Pledge manager survey! This is the time to let us know the specifics of your order, and add any additional things you may like. Also, for people who could not join though the Kickstarter pay system, this PayPal is open to the public! We would love to welcome new backers to Drake! As the interest has been very high AGM is going to be posting some new awesome surprises for folks that I am sure you will all enjoy, sneak peeks will follow shortly! Come and join us, all KS II Horizons pledges are open! 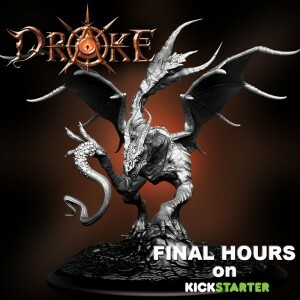 Action Games Miniatures is down to the home stretch for their Drake II Kickstarter campaign. They've made it through a bunch of stretch goals, so your pledge is worth just that much more. Go check it out before it's gone. What an amazing campaign it has been, BUT there is still time left. The most exciting moments of this Kickstarter are yet to come, massive crossbows, tribal monsters, chant magic joined beasts and DRAGONS! Action Games Miniatures makes it through some more stretch goals over on Kickstarter for their Drake II Kickstarter project. Only a few of these terrifying beast have awoken, and each one of them brings fear and doom. The southern Shaka Dragons moved quickly to appease these creatures, who competed with them for food and resources in the old world. Surprisingly they took to the Shaka's plan of alliance and war quickly, most think too quickly... The Crotalis are nearly impossible to strike in combat, their shifting coils move with blinding speed. They posses the most potent venom of the Dragon races, with a bite capable of stopping a mountain Dragon in his tracks. While they do not have the diplomatic touch of the Shaka, they lead their human "allies" effectively, and strike with might against the enemies of the south. Action Games Miniatures has some more stretch goals up on their Drake II Kickstarter campaign. They've got 10 days left to break through a couple of them. In the breeding chambers of the Kaymayuk capital city Great Mystics Dragons endlessly experiment with creating new living weapons. Aided by subservient priests and priestesses these chambers are the birthplace of both horror and wonder. In one litter of joined jaguars there was created an amazing mutation, a mighty cat with the wings and claws if an eagle. As the Saan Dragon overseeing the birthing moved to destroy the failed experiment, one priestess, Akra, begged mercy for the creature. She claimed to have a vision of its creation and of it bringing glory to their people. The Dragon was amused by this and bound the beast to Akra's mind. Now she must fight on the front lines to prove her chosen beasts value, and strikes with deadly precision against the enemies of The Great Mystics. Action Games Miniatures has posted up the 3D render for their Kickstarter-exclusive mini that's part of their Drake II campaign. 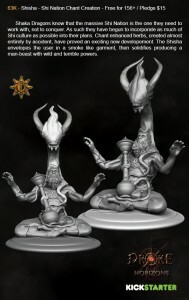 Action Games Miniatures has a preview render up of the Shisha stretch goal for their Drake miniatures game Kickstarter. There's a good chance it seems that they'll make it. Full-size photo is way down at the bottom of their page. One of our weirder beings, the Shisha is created from chant enhanced herbs. When smoked it covers the user like armour, and grants them amazing short range missile attacks. Pledge to help us unlock this cool unique model! 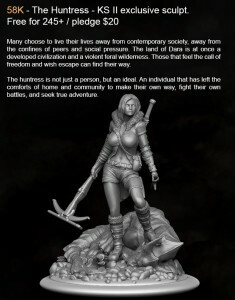 Action Games Miniatures posted up some new stretch goals for their Drake Kickstarter campaign. They've already gone through some of them in the process. Also Drake II recently unlocked the "Free Dragon" stretch, winged beasts for all! Action Games Miniatures has announced a surprise stretch goal as part of their Drake II Kickstarter campaign. They're most of the way to it, already, if they haven't already passed it on by! 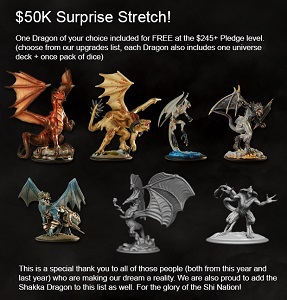 One dragon of your choice included for FREE at the $245+ pledge level! 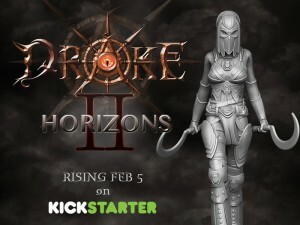 Action Games Miniatures has their Drake II: Horizons Kickstarter campaign underway. It's already more than 2x funded, so it's onward to stretch goals for 28 days. A powerful dragon army rises from the South in the second chapter of Drake: The Dragon Wargame, a 28mm miniature fantasy skirmish game. Action Games Miniatures has announced they will be running a second Kickstarter for their Drake system in order to expand the line and hopefully bring the game to the commercial market. It is time for Drake to return! Many people from all over the world have asked us if they can get involved in our amazing game, now is the time! Thanks to the support of our amazing backers over the last year, we are able to offer a 4th force for our game. This exciting campaign will hopefully unlock some awesome stretch goals and allow us to raise money for packaging and shipping, to launch our game commercially. In celebration of this announcement we present our Drake Mini-Book. Please download a copy! Action Games Miniatures regrouped after their first Kickstarter for Drake and had a very successful second run, making over 1000% funding. Now they're about to start shipping out the game to an anxious public. Our Dragon Game is about to leave the nest! Time to start letting the world know. Drake: The Dragon Wargame is about to send its first shipment. Presenting the first of many cool dragons: The Rish Dragon. We are updating our website with all our new minis and rules and getting ready to start sharing our style with the world, come check us out! 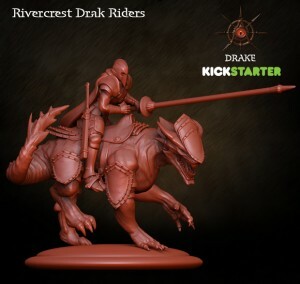 Action Games Miniatures had a lot of success with their Drake Kickstarter the second time around. They know not everyone might have been able to partake in the event, so have started taking pre-orders on their website as well for any who may have missed out. WOW what an incredible Kickstarter! Thank you all so very much for such an amazing experience! In response to requests from the public AGM will be offering a PAY PAL page which will still give you the same options as our Kickstarter for a limited time, ending on May 3rd. Check out our Kickstarter page if you wish to become a Dragon General and summon deadly creatures! Or want to add some unique and incredible models to you collection. All our Kickstarter deals and stretch goals will stand until the 3rd of May ONLY. 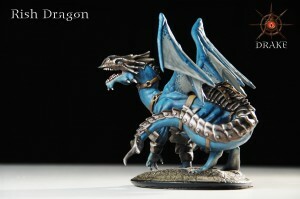 Action Games Miniatures has just one day left on Kickstarter for their Drake: The Dragon Wargame. Can they make it to $100k? I wanted to take some time here to take about our game and story, as well as where we are headed in the future. I also have some tasty concept art tid bits to share! 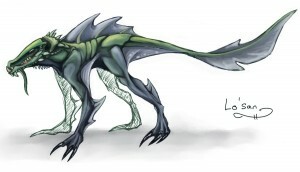 Speaking of cousins, the Lo'san have long been formidable guard beasts of Dragon lairs. Scavengers who are attracted to the remains of the mighty Dragons kills, they have for many centuries guarded their large master's homes with loud throaty calls alerting all nearby of intruders. Action Games Miniatures has posted up photos of two of their painted-up warbands over on their Kickstarter page. Thanks everybody for helping us unlock Soo'lan The Water Nymph as the 72K stretch goal! This deadly lady is now available as a $15 upgrade. To celebrate, we'd like to share some awesome group photos we shot today. We hope you like 'em. Action Games Miniatures has posted up a new video battle report for their Drake: The Dragon Wargame, which is in their final couple days on Kickstarter. AGM is very proud to present this battle report video! We had a great time making it and wish to thank the entire crew for their hard work and dedication. THANKS GUYS!!! Our Kickstarter is in its final week, there is still plenty of time to get into our game at a big discount and we hope everyone checks out the page for all the goodies! 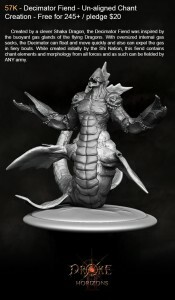 Action Games Miniatures is showing off another 3D render for Drake: The Dragon Wargame over on their Kickstarter. They've also made it past the $65k mark. Wow... seriously we LOVE this model. Really an excellent example of our game style. Behold the Rivercrest Drak Rider! 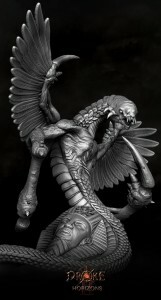 AGM is proud to offer this model as a FREE stretch goal for our Drake: The Dragon Wargame Kickstarter campaign! 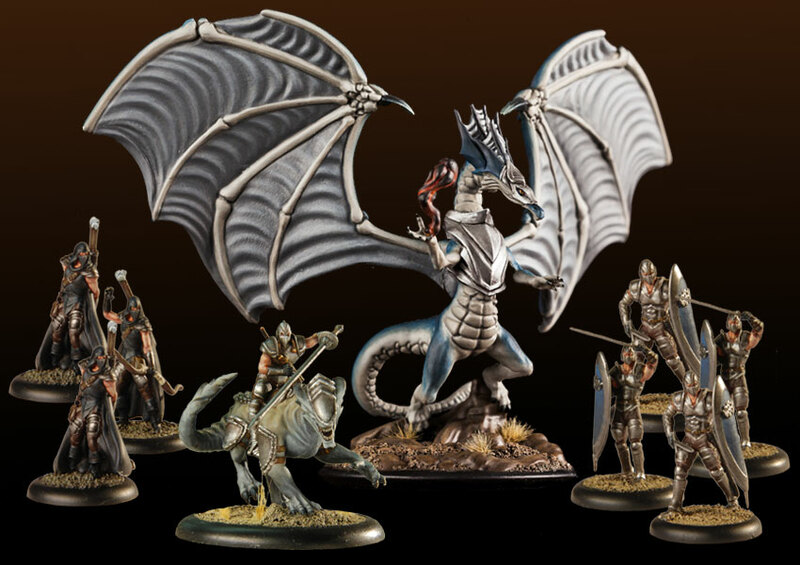 Action Games Miniatures keeps rolling along with their Drake: The Dragon Wargame Kickstarter project, making over 6x what they were hoping for. They've got some new 3D renders up as well as some painted finished versions. AGM is proud to present these painted Rivercrest Swordsmen from our Drake Kickstarter campaign! As well our incredibly beautiful and very dangerous High Priestess. Check out our campaign for all the details and our awesome Dragons!!! Action Games Miniatures broke $50k in their funding. They're also showing off some WIP versions of their Rivercrest Swordsmen as well as a 3D render of The Twins. We have made it to $50K!!! AWESOME thank you all so very, very, very, very much!! Next up is our Hardcover Rulebook and to make this goal even more incredible I present a special companion piece: our book-loving, nation-destroying, army-building, sisters of mayhem... The Twins! These beauties are included FREE with every $240+ pledge when our Hardcover Rulebook stretch goal is reached! Action Games Miniatures is doing rather well over on Kickstarter, having made it through their $45k stretch goal. Woot! They're also showing off new Eradicators units. Drake has passed our $45,000 stretch goal! The Oolen spirit creation has been added to every army box for FREE (3 are added to the ultimate collection.) It is with great pleasure that we reveal the ERADICATORS!!! Under $5K to go until players can field one of these Ultra-heavy Chant Creations. We also have a new video on the Kickstarter website with some Infantry and small based models being un-boxed. Lots more surprises to come , thank you everyone! 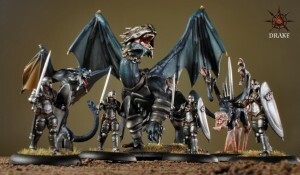 Drake: The Dragon Wargame by Action Games Miniatures has made it up and over their $40k stretch goal and added heavy infantry to people's orders. Drake: The Dragon wargame just passed its $40K Stretch goal. New FREE heavy infantry added to every army box level or above pledge. Our first Podcast is available through the updates section (update #24) detailing some of the gruesome mystical details of some of our new models. Army list summaries and additional game data are available in our updates section as well. New models will be out for preview this week. With a month left to go on our Kickstarter we will certainly have more exciting announcements ahed! Drake: The Dragon Wargame has a new dragon unlocked in their Kickstarter campaign. Next up is heavy infantry. 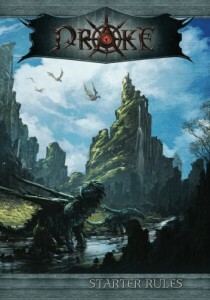 Massive beasts, unstoppable Dragons, deadly summoned creatures, Dara is a land of peril. Wise generals will field Heavy Infantry along their ordinary rank and file to punch through tough enemies. 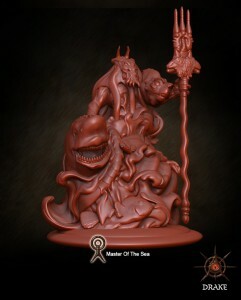 One unit of 3 models added FREE to all Army Box's and higher pledges when we hit this stretch goal.